Why Not A Standard FO Connector For Premises Cabling? 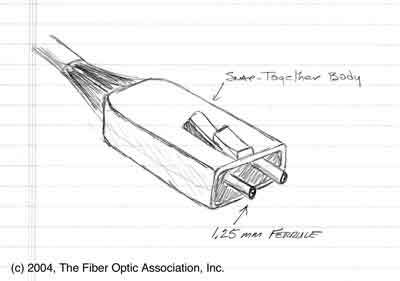 Last month we proposed that the fiber optic industry again look at the idea of a "standard connector" - not a connector for every application, which is not realistic, but a small duplex connector for patch panel to equipment connnections. We have publicized the idea and gotten lots of interest. What Is The Reaction To The FOA Proposal? Industry reaction to our proposal has been much more positive than even our most optimistic expectations. Sure, we got a couple of "you're nuts" and " surely you are kidding" reactions, but the vast majority of responses, even from connector manufacturers, are like this one, "it has come to the time where a standard connector should be established." Within the networking equipment market, we heard opinions that the duplex LC has already become dominant, with most transceivers for 1, 4 and 10 gigabit networks now available in duplex LC format. A simple duplex body that is LC plug-compatible but has a single solid backshell for use with the new small cable designs to replace the two LCs in a duplex configuration is a non-issue to the component and equipment manufacturers, but they understand the appeal to end users. It has also been pointed out that our proposal is simply voicing what industry insiders already know, that the duplex LC has become the de facto industry standard already. Our proposal for a single body version, while offering a more streamlined design, is perhaps more a focal point for industry discussion of what has occurred in the marketplace than a technical innovation. And our timing is spot-on. The TIA TR 42.8 committee is currently considering changes to the "C" revision of TIA-568, so let the discussions begin! 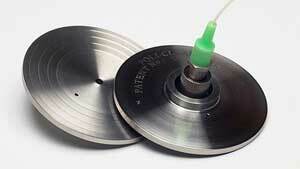 CSS has introduced a new polishing puck designed by FOA co-founder Prof. Elias Awad. What makes this puck different is the rings on the bottom. The rings act as a wear gage, minimize fiber exposure to polishing debris, minimize wear on the polishing film, as well as monitor fixture wear and perpendicularity. The design was awarded US Patnet # 6,485,362,B1 and is marketed under the trademark "poli-Clean." The fixture is available for both 2.5 and 1.25 mm ferrules, straight PC or angled APC finish. The FOA has always focused on creating better educational opportunities in fiber optics - it's our charter: we're a non-profit educational organization. We've done two things recently to expand that commitment - both here on the FOA website. We have over 120 schools and hundreds of instructors teaching at those organizations, and we'll notify them about these new web pages, but we invite any instructor interested in fiber optics to dig in and use these pages too. Our online TTT program is the beginning of qualifying for the FOA CFOS/I Instructor Certification. Soon we'll have the program set up for instructors to register to begin qualifying for the certification. This industry is starting to take off, almost 20 years after the first fiber-to-the-home tests. A new report from KMI Research shows why now, how much, and what it all means for the telecom industry. The report is Fiber to the Premises in the United States: The Promise of Universal Broadband Access. The competition to provide broadband is heating up. More companies are getting involved, and more are turning to fiber, some in huge quantities. KMI,s report forecasts a $3 billion market for equipment, cable, and apparatus by 2009. KMI, a specialist in fiberoptics and communication, has tracked this market for decades, and brings you a new look at the different fiber-in-the-loop architectures, and the amount of equipment, cable, and related products that will be needed. The report,s forecasts will benefit companies making products from chips to backhoes. a) Total FTTP market for equipment, cable/apparatus in 2009 will be $3.2 billion, a 54% CAGR increase from 2003 based on gradually stronger subscription rates during the forecast. b) Forecast of cabled-fiber demand related to FTTP/FITL in the U.S. will contribute to a 19% CAGR for the total U.S. single-mode cable market from 2003 through 2009.
d) Market forecast of LEC vs. municipalities/utilities, FTTP through 2009. The telco market contribution will grow from 3% of electronics and cable/apparatus market in 2003 to more than 70% through the forecast period. Jim Hayes, President of The FOA, made a presentation to the TIA TR-42.8 committee at the June 8, 2004 meeting in Providence, RI, covering the recommendations of the FOA for revisions in the "C" version of TIA-568 standard for structured cabling. 568 is currently in the "B" revision but work should begin soon on the "C" version. Until 568B, fiber optics was an afterthought. 568B added a separate section to cover the unique aspects of fiber, enhancing the attractiveness of fiber to many users. However, there are still issues with 568B, including test requirements, that make fiber optics confusing to many potential users. The FOA board, members of which have over 20 years experience in fiber optics on the average, reviewed the 568B standard and discussed these issues at length, then produced a document with our recommendations. You can read the whole PDF document here. Jim will continue attending TR-42.8 meetings to work with the committee in developing 568C and representing the interests of our organization and our CFOTs. What test is always required for an installed fiber link? The FOA CFOT and CFOS programs continue to gain momentum in fiber optics. Over 13,000 CFOTs have been certified by 114 schools as the FOA completes its 9th year. Since our founding in July, 1995, we have dedicated ourselves to promoting fiber optics and professionalism in fiber optics personnel, focusing on education and certification. We are continuing to add new schools and more CFOTs as users of fiber optics learn that a CFOT is the indication of a professional, well-trained fiber optic technician. Now with FTTH (fiber to the home) finally taking off, demand for CFOTs is rising and schools are responding by expanding programs rapidly. The FOA now has approved programs at 114 organizations, welcoming new additions like Corning Cable Systems for their installation training programs and NASA's Goldstone Tracking Station. The complete list of FOA-Approved schools is at http://www.thefoa.org/foa_aprv.htm. What Loss Should You Measure When Testing Fiber Optic Links? Don't miss Eric Pearson's Newsletters - with some tests on connectors. New sections of "Lennie Lightwave's Guide To Fiber Optics" covers loss testing of fiber optic cables and OTDRs. We have been asked if we could send the FOA newsletter by email or post it on the website. We are looking into that and will definitely get one started soon. When you renew your certification, you will be asked if you are interested in email newsletters and if so, you will be asked to give your email address for us to use in a mailing list. If you want to get started now, send an email to info@thefoa.org with the subject "eMail List"
(C)1999-2004, The Fiber Optic Association, Inc.
Tech Puzzler: Insertion loss, of course. We see more requests for OTDR testing, and that's OK, as long as it's appropriate for the cable plant - e.g. no short links - but insertion loss with a meter/source or OLTS is mandatory!